We made these swings nearly five years ago, and they ended up being one of our very favorite things in our yard! 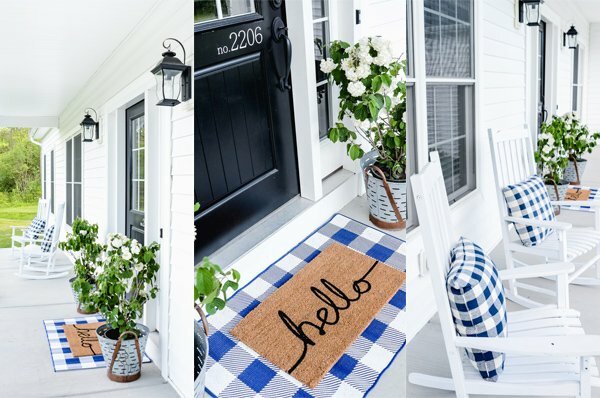 I decided it was time to re-share, and it’s a perfect spring project for the yard. I wish I could retake pictures with a lot of different angles, but we no longer live in this house…or state. We can’t wait to do it again in at our new house, once it’s built! With six kids that all love to swing, there just isn’t enough room on our play set to accommodate everyone–especially needing two baby swings. So I came up with a plan! How about taking advantages of the trees in our yard to add more? 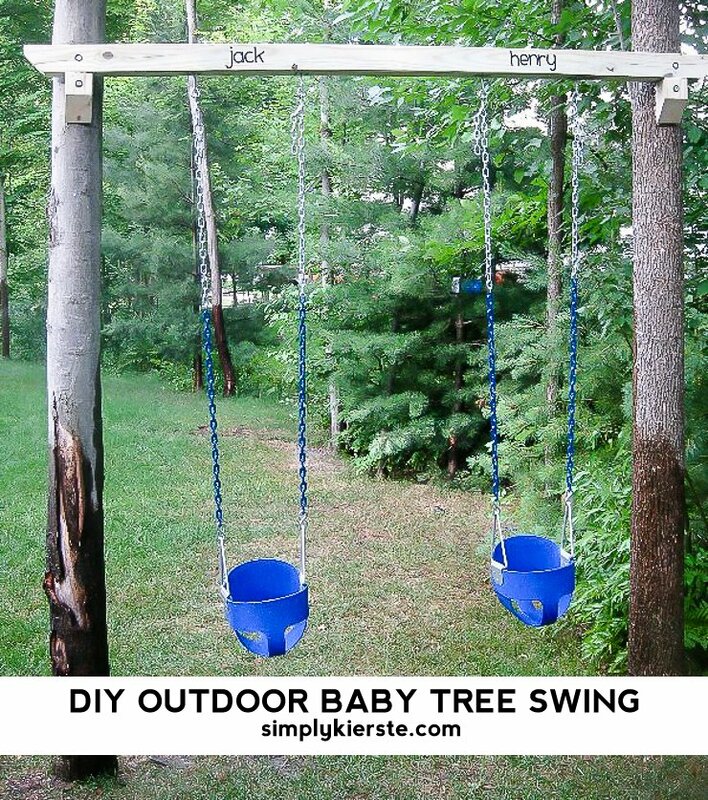 A few 4×4 posts and a little hardware was all we needed to make these adorable and very popular DIY Outdoor Tree Baby Swings! If you don’t need baby swings, you can also use kid swings, or even a tire swing–whatever you need! I’m so excited! It was just finished last night, and already the babies didn’t want to come inside. It’s going to be so nice to have a swing for everyone! We do already have the playset, but you could also use these instead of one–it’s a much cheaper alternative if you want swings. 2. 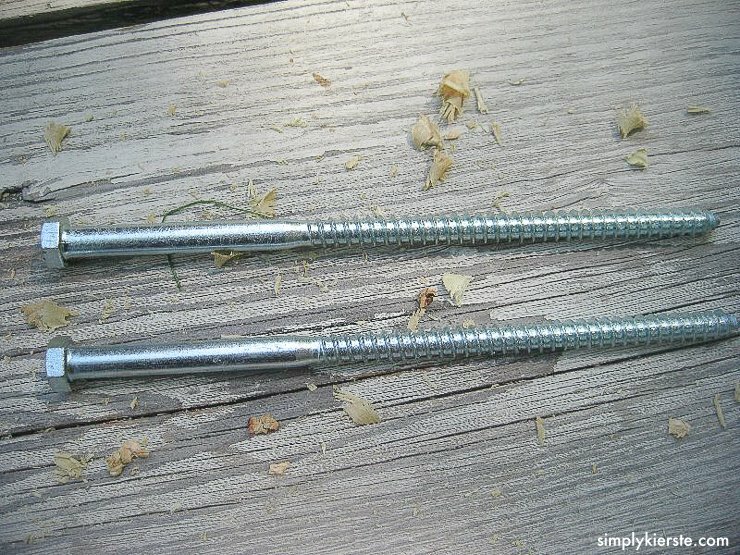 Make an angle cut on each end of your long 4×4 post (for aesthetics). Sand it well–removing any writing and rough edges. This will be like a shelf, and sit on top of the pieces you just attached to the trees. Once it’s centered on either side, use Liquid Nail to glue it on top of the attached pieces. 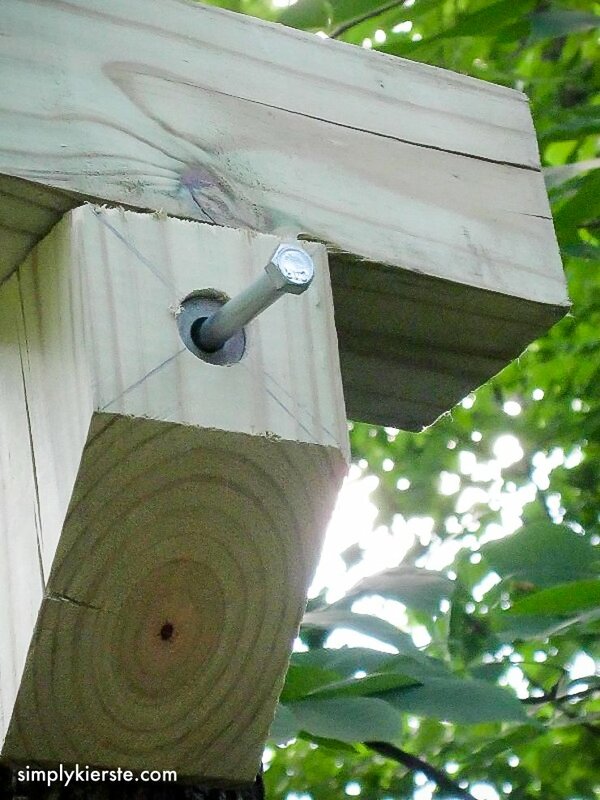 Then you’ll add another lag bolt directly above the first one, going through your long 4×4 post and attaching it to the tree. 3. Following the directions on the swing hangers package (we bought ours at Home Depot), attach them to the bottom side of the 4×4 post. Hang your swings! We used bucket swings–they are heavy duty, and large enough for not only babies, but toddlers, and even kids up to four, depending on how big/tall they are. Most of our kids could use them, which is what we were after. You could easily use kid swings in this space instead–whatever you need! Hi! I love this idea! Thank you for sharing. 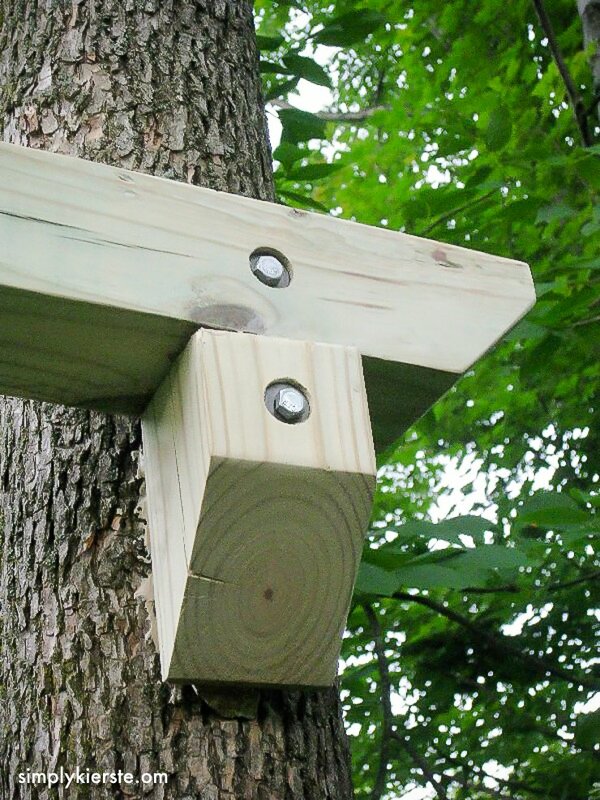 Do the bolts go all the way through the tree with a nut on the opposite side of the tree? No, they didn’t. The trees were pretty thick, and we put them in really far. If you can get them all the way through, it certainly wouldn’t hurt!!! The biggest cost was the actual swings–so that just depends on how much you want to spend. 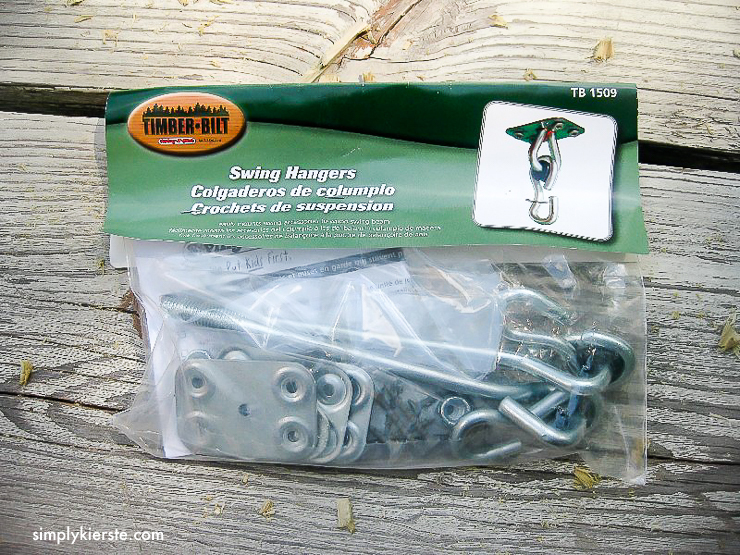 (I bought them on Amazon, and got really heavy-duty swings.) Everything else–the wood and hardware–was probably around $30 or so. It’s been several years, so I don’t remember exactly, but it doesn’t use much wood and the hardware isn’t crazy expensive. Good luck! We LOVED it, and can’t wait to do it again at our new house when it’s built!